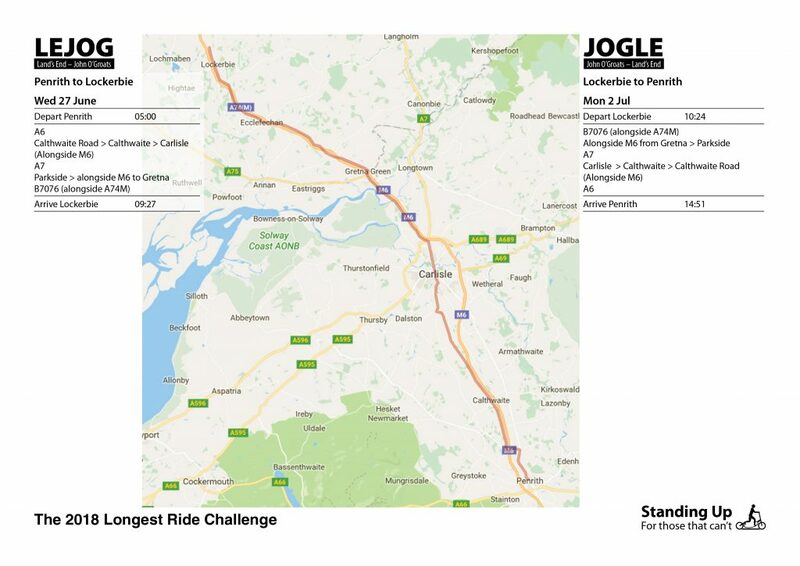 Below is the live tracking map and also a day-by-day schedule for the 2,700km (1,700-mile) Double End-to-End Challenge (Land’s End to John o’Groats & back to Land’s End) taking place from 24th June until 5th July 2018 as part of The 2018 Longest Ride Challenge. Tracking for the 2018 Longest Ride Challenge is sponsored by Nautoguide. The ride will be a verified Audax UK Randonneur Challenge and also a Guinness World Record attempt. 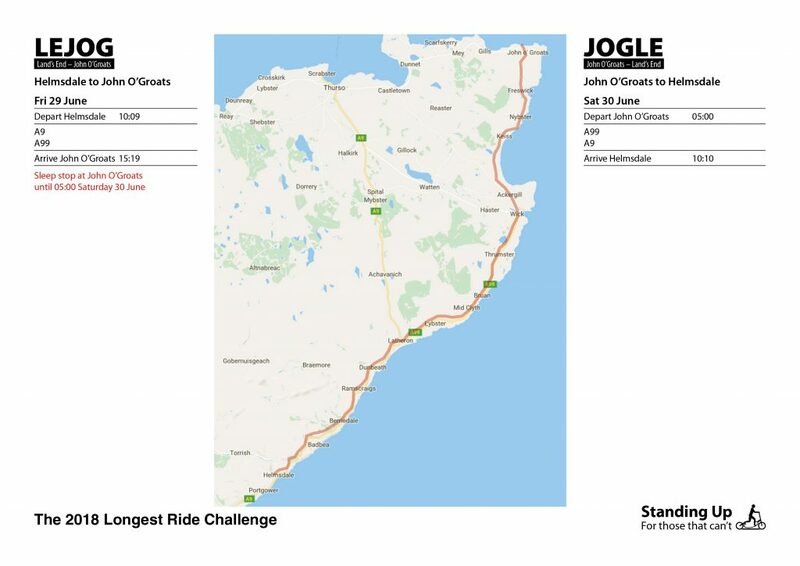 The Guinness World Record time-limit for the Return Journey between Land’s End and John o’Groats by elliptical bike is 14 days, while the Audax UK time-limit for the 2,700km distance is 13.5 days. So the goal is to go under 13.5 days for the full Double End to End ride (and the official schedule actually aims for 11.5 days in order to beat both time-limits). 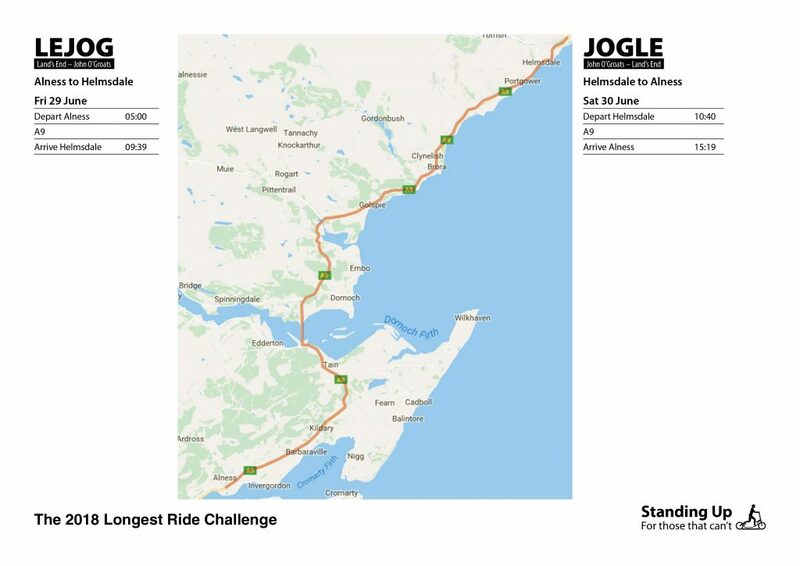 The ride is split into 17 stages which are outlined on the maps below. Each outbound stage (including a list of the roads we will traverse) is described on the left hand side of each map and the corresponding return stage is described similarly on the right hand side of each map. Outbound stages are titled in black text and return stages are titled in red text. Notes: Alan & Idai to begin the 2,700km (1,700-miles) Double End-to-End Guinness World Record Attempt, with the goal of finishing the full journey in under 13.5 days (target is 11.5 days). Jim & Stu will both start the ride with us – and will continue with us for the first 2 days (approx. 300-miles) of the ride, until we reach Shrewsbury. Total cumulative distance 52-miles. Notes: Riding with Jim & Stu until we reach Shrewsbury. Total cumulative distance 100-miles. Notes: Riding with Jim & Stu until we reach Shrewsbury. Idai to stay with Iain G. in Taunton. Total cumulative distance 156-miles. Notes: Still riding with Jim & Stu until we reach Shrewsbury. Also planning to meet Lyn in Bristol for breakfast, during her visit from the USA. She’s already completed her longest ride for The 2018 Longest Ride Project (when she was back in the USA). We will have breakfast at The Boston Tea Party (Cafe) in Bristol between 8 and 9am – because there will be a large group (at least 10 of us – including Lyn & Kim with the support vehicle). Total cumulative distance 201-miles. Notes: We will have breakfast at The Boston Tea Party (Cafe) in Bristol because there will be a large group (at least 10 of us) meeting here between 8 and 9am. Tim will join the ride in or just after Bristol and he’ll ride with us until we reach Lancaster. 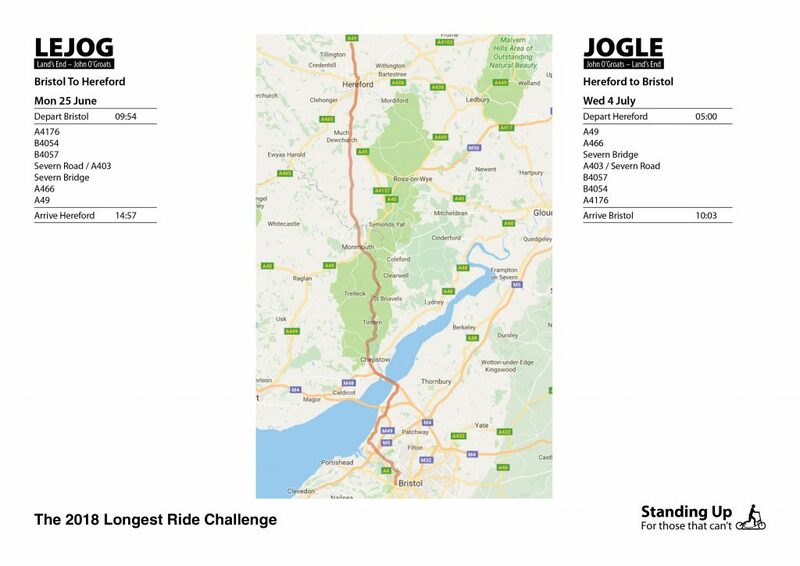 James will join us in Bristol for breakfast and will leave around Chepstow. Jim & Stu will ride with us until we reach Shrewsbury. Total cumulative distance 253-miles. Notes: Idai to meet Mark near Shrewsbury and will stay with Mark overnight in Shrewsbury. Jim & Stu will catch the train home from Shrewsbury – after 2 days (and about 300-miles of riding). Tim continues with us until Lancaster. Total cumulative distance 306-miles. Notes: Alan, Idai & Tim continue northwards. Mark starts riding with us in Shrewsbury and stays with us for just over 70-miles, before making his way back to Shrewsbury on his own. 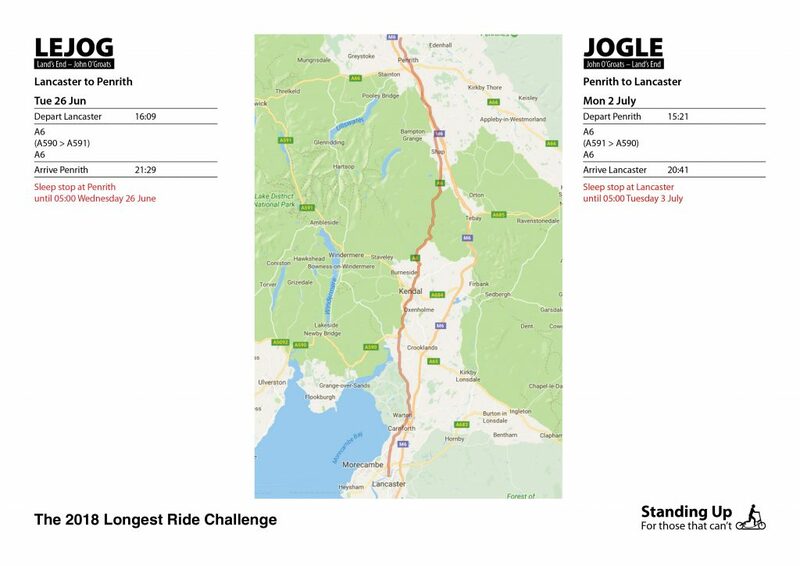 Mark will have completed his longest ride (approx. 145-miles) for The 2018 Longest Ride Project when he gets back to Shrewsbury. Total cumulative distance 358-miles. Notes: Tim rides with us up to Lancaster. We plan to meet Andy around Preston/Lancaster for a few hours of riding. Total cumulative distance 409-miles. Notes: Andy departs by this point. Might catch us on the way back. Total cumulative distance 458-miles. Notes: Total cumulative distance 504-miles. Notes: Meet Alex here. He’ll stick with us for about 25-miles before riding to Glasgow. Then hopefully we’ll connect again a few days later, as he will be doing his own longest ride for The 2018 Longest Ride Project (the ‘JOGLE’ End to End) from 2 July. Total cumulative distance 554-miles. Notes: Riding with Alex, but he will leave us during this stage and head to Glasgow. Total cumulative distance 599-miles. Notes: Total cumulative distance 655-miles. Notes: Total cumulative distance 705-miles. Notes: Total cumulative distance 750-miles. Notes: Total cumulative distance 798-miles. Notes: We meet Adam & Thomas here. 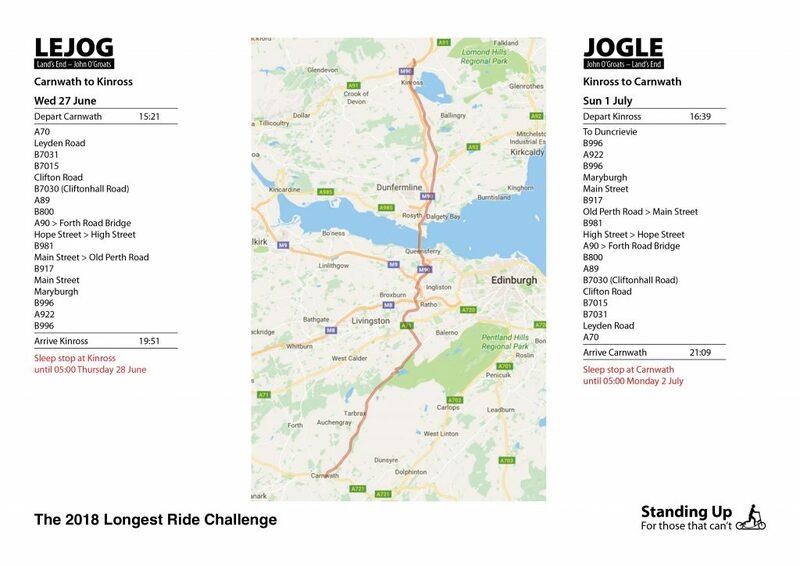 Adam will ride with us for 2 days (295-miles) between John o’Groats and Carnwath, while Thomas will go all the way to Land’s End with us, to complete a full End to End Ride. 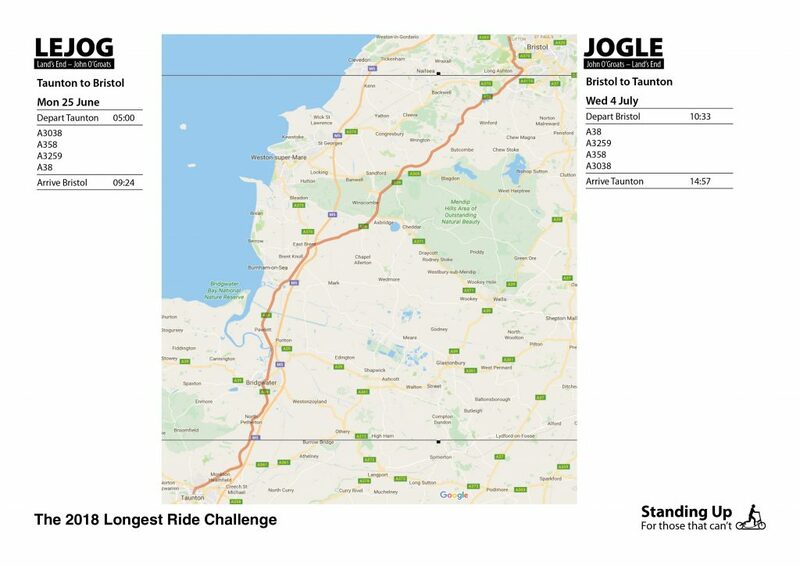 Both Adam and Thomas will have completed their longest rides ever and will have fulfilled their pledges to The 2018 Longest Ride Project). Total cumulative distance 850-miles. Notes: For the return leg the riders going all the way back to Land’s End will be Alan, Idai & Thomas. 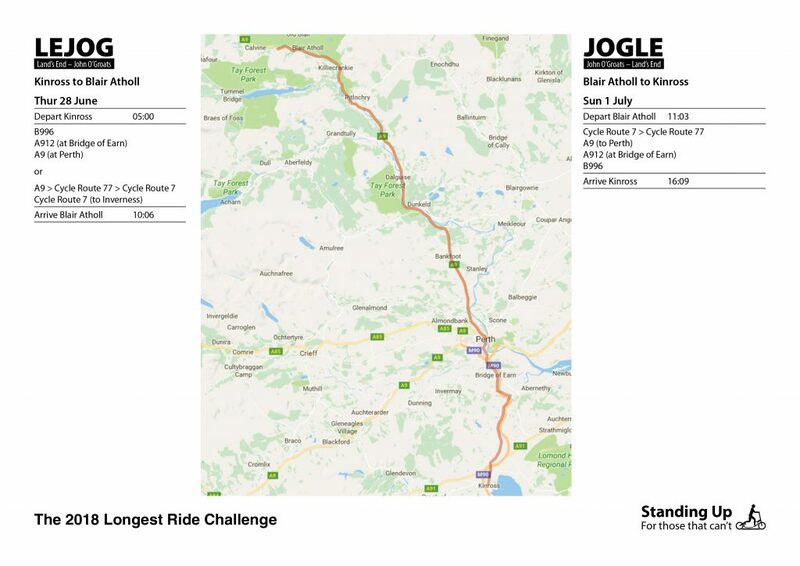 Adam also rides this first return leg stretch with us and continues with us for next 2 days. Total cumulative distance 903-miles. Notes: Adam rides this stretch with us. Total cumulative distance 950-miles. Notes: Adam rides this stretch with us. 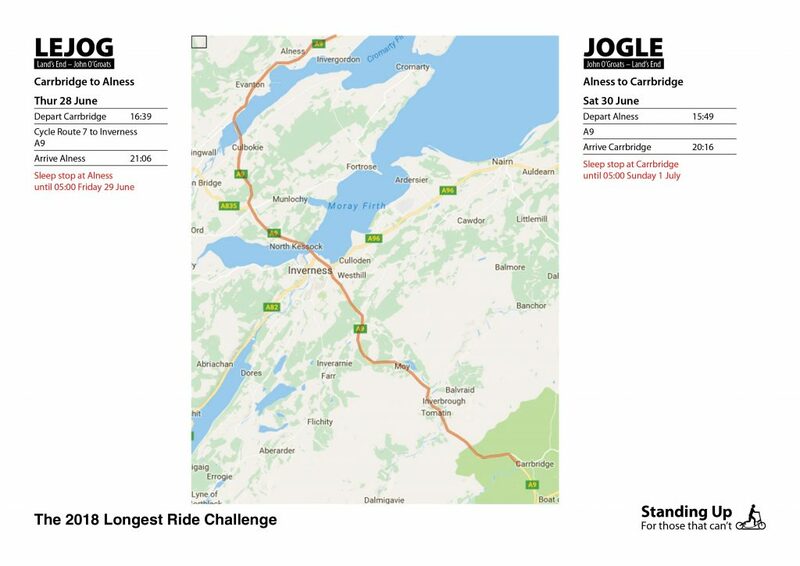 At the end of this riding day both Alan & Idai will have exceeded their previous longest ride of 1,420km (about 890-miles) which they achieved during the 2013 London Edinburgh London Audax (LEL 2013). Thomas still with us at this point – and all the way to the end. Total cumulative distance 996-miles. Notes: Adam rides this stretch with us. Alan & Idai will be crossing the 1,000-mile barrier during this stretch. Thomas still with us, all the way to Land’s End. Total cumulative distance 1,053-miles. Notes: Adam rides this stretch with us. Total cumulative distance 1,098-miles. 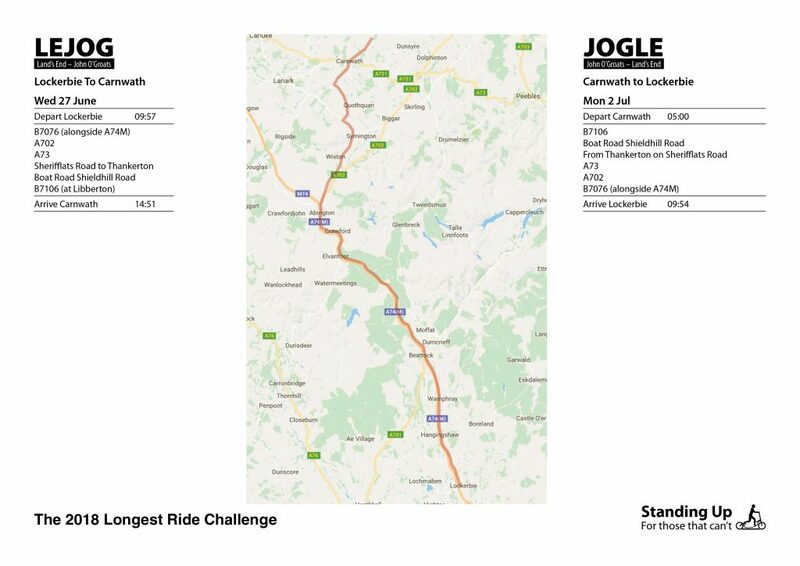 Notes: Adam rides up to Carnwath with us. Stops over here and then departs (at which point he will have completed his longest ride, of approx. 295-miles, as part of The 2018 Longest Ride Project). Alan, Idai & Thomas continue from here. Total cumulative distance 1,147-miles. Notes: Total cumulative distance 1,197-miles. Notes: Total cumulative distance 1,242-miles. Notes: Idai to stay with Iain N. in Carnforth. Andy is likely to meet us here for a few hours of riding and will leave us somewhere between Lancaster and Preston. Total cumulative distance 1,291-miles. Notes: Total cumulative distance 1,342-miles. 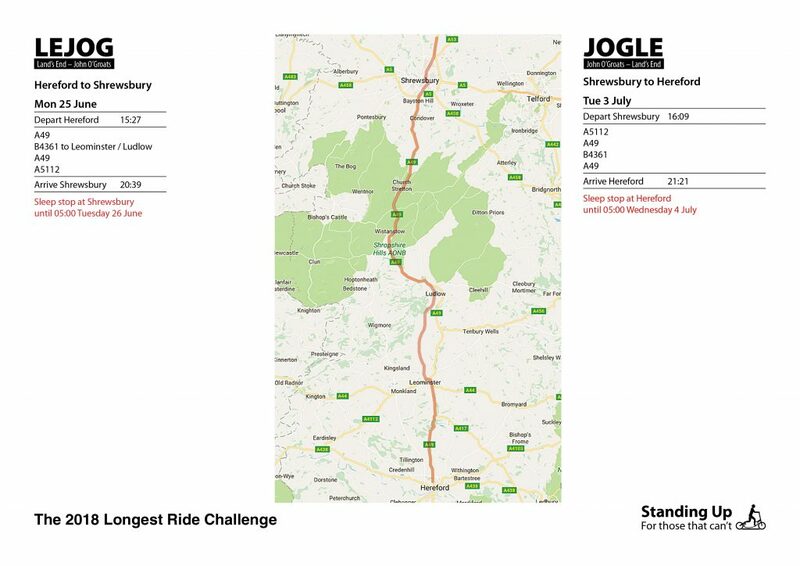 Notes: Andy B. hoping to meet us on this stretch and ride with us from Whitchurch until Shrewsbury. Thomas will still be with us. Total cumulative distance 1,395-miles. Notes: Tim may ride this stretch with us, as we stay overnight at Tim’s house then rejoin Alan at 5am on the next morning to ride to Okehampton. Total cumulative distance 1,447-miles. Notes: Alan, Idai & Tom to continue towards Okehampton. Total cumulative distance 1,500-miles. Notes: Total cumulative distance 1,544-miles. Notes: Total cumulative distance 1,648-miles. Notes: Alan, Idai & Thomas are scheduled to finish the Double End to End Challenge at Land’s End around 15:15 in the afternoon. Total cumulative distance 1,700-miles for Alan & Idai (and 850-miles for Thomas). 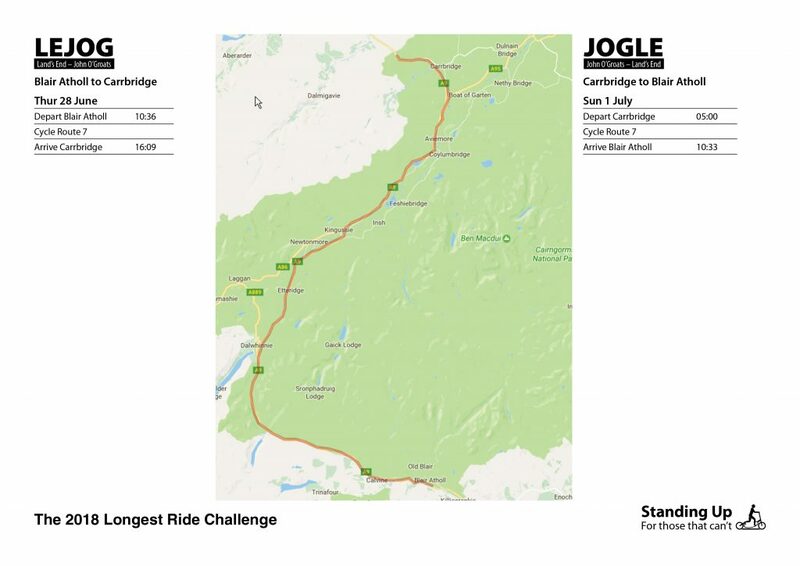 All 3 will have completed their lifetime longest rides (Alan & Idai ‘LEJOGLE’ in 11.5 days & Thomas ‘JOGLE’ in 5.5 days).